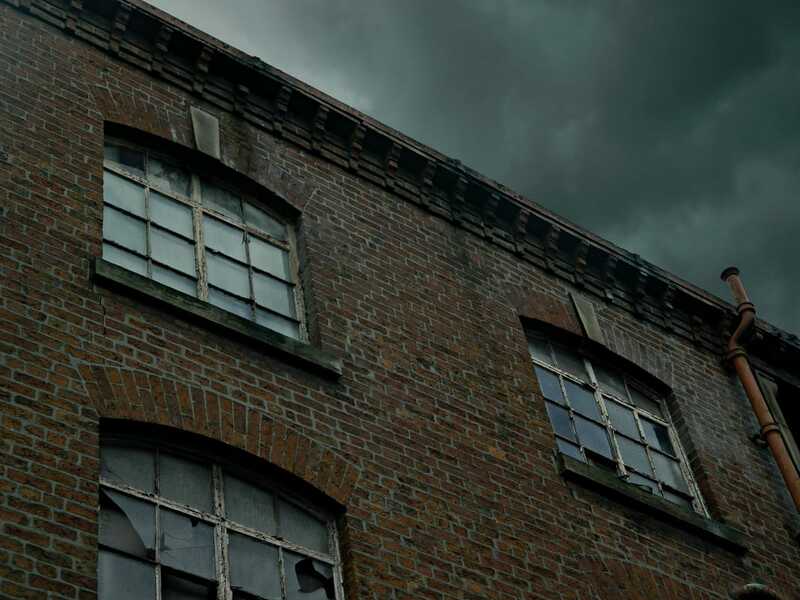 I feel this photograph is very visually striking, with the dark, foreboding sky on the verge of a storm and the low angle looking up at the shattered windows. In hindsight, I think I should have kept the overgrowth on the roof in the original photograph, to highlight the building’s state of abandonment and decay, but due to the extent of editing on the photograph, this would have been too difficult to achieve. 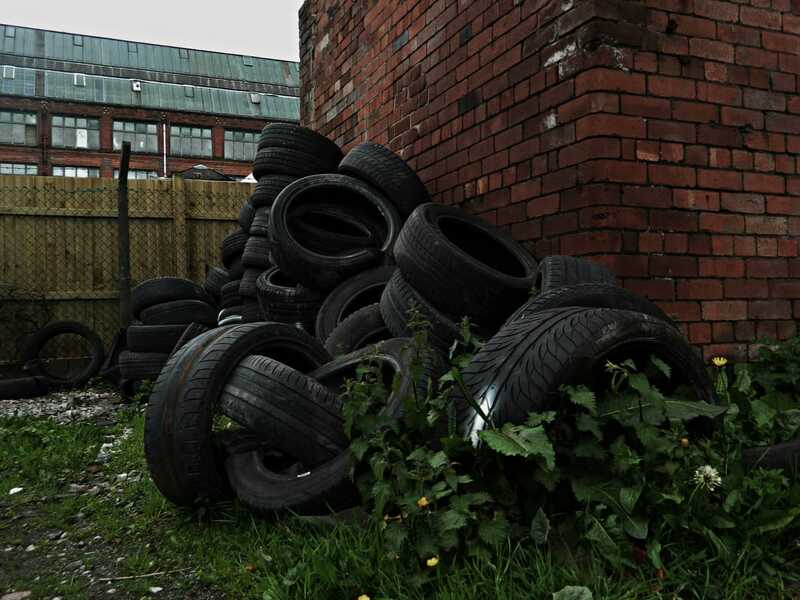 I personally think that the low angle I opted for in this photograph works well with the subject matter, by making the height of the pile of tires seem much taller. I edited the photograph by increasing the contrast and sharpness while decreasing the darkness. 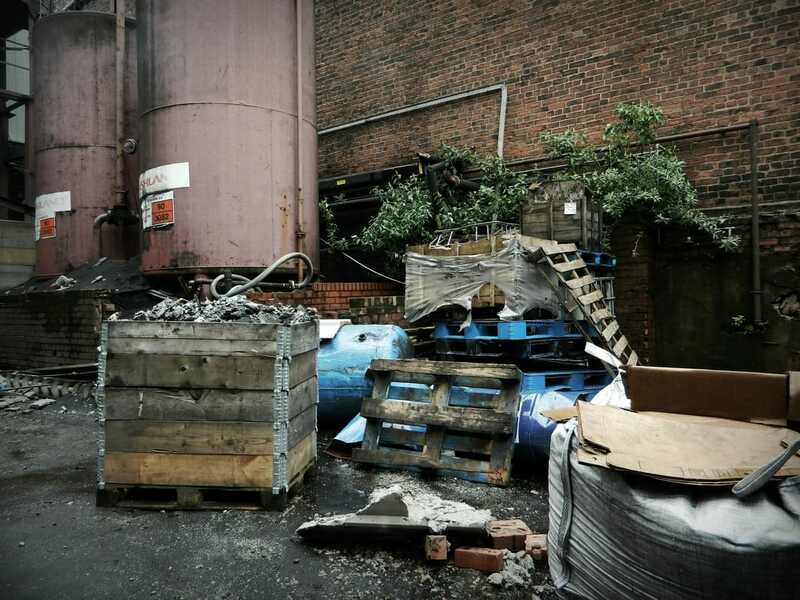 This created the effect of a dark and gritty atmosphere, while increasing the sharpness brought out the rough textures present in the photograph, for example the rubber tyres and the decaying bricks. The composition of this photograph feels very claustrophobic, having been taken from behind the bars and almost from the perspective of the inside looking out. By decreasing the darkness and increasing shadows, I made the sky look much more darker and foreboding. Increasing the contrast also brought out the vibrant green colour of the graffiti. 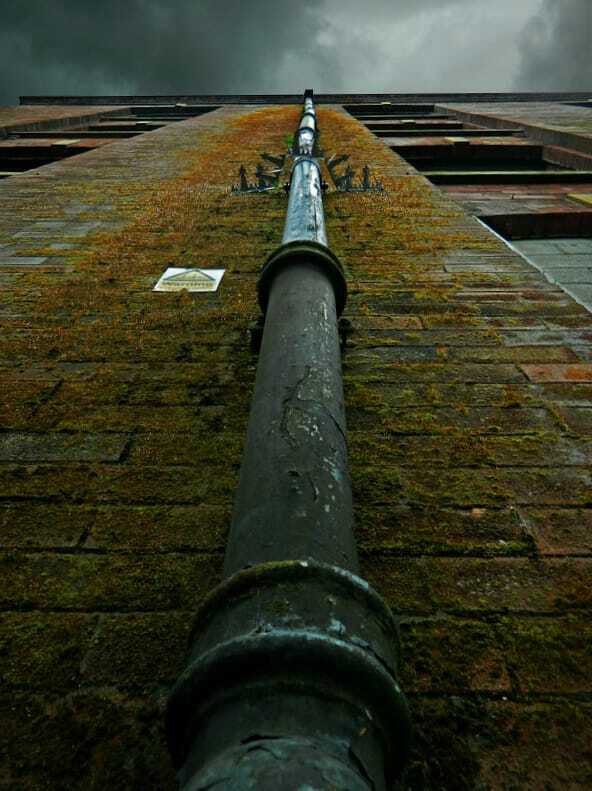 The low angle of this photograph makes the building look daunting, as though it is towering above the person, with the symmetrical position of the pipe emphasizing its height. 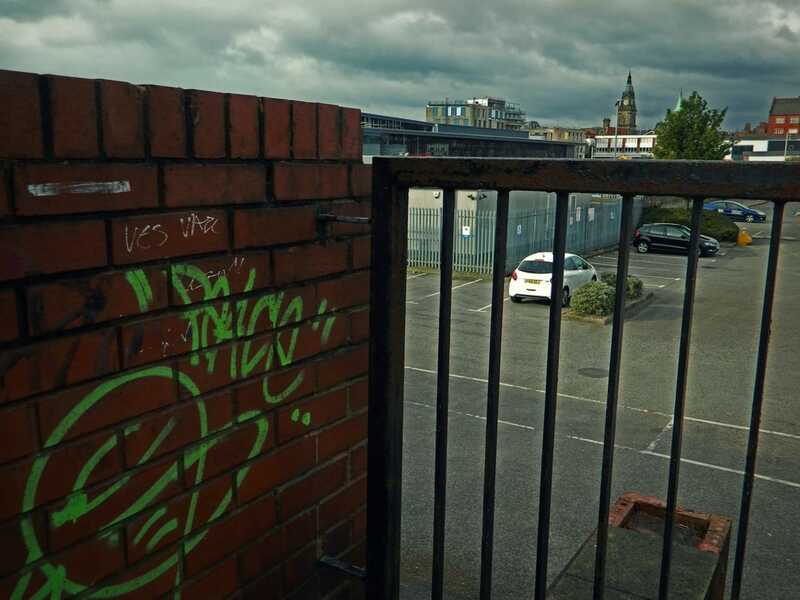 The increased contrast on the photograph really draws attention to the moss on the building, which creates a ghastly image of decay and abandonment. 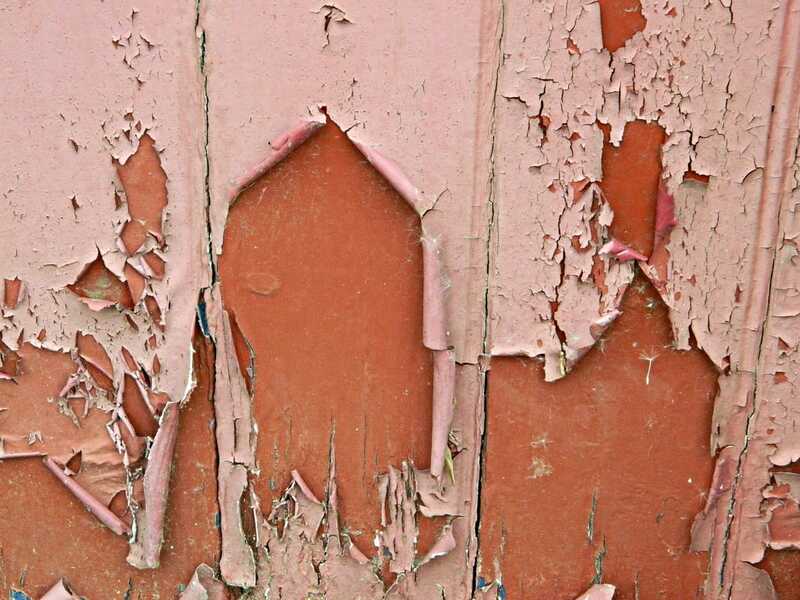 This is also emphasized by the rough texture of the photograph.